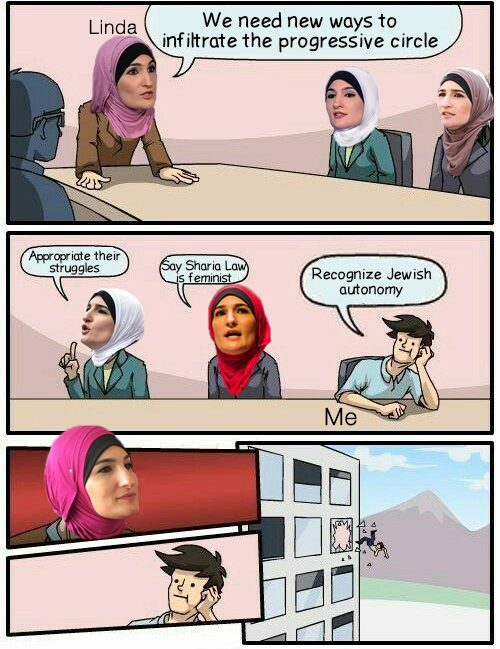 But what has happened often from White Jews when they call you call an antisemite, is they look at Muslim women from an orientalist trope, that we are inherently antisemitic because we are Muslims, right? Where to begin? White Jews. Two of the most hated groups among leftists and Muslims like Sarsour and Omar evidently. The inclusion of the word white is an attempt I suppose to do the old good Jew Bad Jew thing; a common anti-semitic trope. This is also an attempt, like all the rants these bigots give, to mainstream antisemitic tropes. Orientalist? Well, this is a reference to failed Jew hater and PLO member Edward Said's definition of "a way of seeing that imagines, emphasizes, exaggerates and distorts differences of Arab peoples and cultures as compared to that of Europe and the U.S. It often involves seeing Arab culture as exotic, backward, uncivilized, and at times dangerous" Exotic? Eye of the beholder. Backward, uncivilized, and at times dangerous? Well, look at what they do and say. Geeze, a whole Arab nation, Brunei has progressed so much it is now stoning gays in 2019. If that ain't backward, uncivilized and dangerous, I don;t know what is. Stereotype? Well, if it walks like duck....show me a Muslim that isn't Pro-BDS or or anti-Israel and I'll show you a Muslim that isn't antisemitic. Until then, the shoe fits Linda. In politics, and especially the politics of the Middle East, it is rare for government officials to speak the unvarnished truth. That is why the comments of Jason Greenblatt, US Special Representative for International Negotiations, at the United Nations are notable. The Palestinian Authority’s institutionalization of support for terrorism is unacceptable and must be called out, unequivocally by all of us. The time has come for everyone to stop looking the other way. It is because we care about the Palestinian people, and because we want a better, brighter future for their children that we seek to ensure the Palestinian Authority puts the interests of ordinary Palestinians first. Eli Lake: Do Democrats Want a U.S.-Saudi Alliance or Not? Barring any last-minute development, some Palestinian prisoners held in Israeli prisons will begin a hunger strike on Sunday. Israel Prison Service (IPS) officials and representatives of the prisoners held meetings in the past 48 hours in an attempt to prevent the planned hunger strike. The negotiations between the two sides are expected to continue until late Saturday. The inmates are demanding the removal of signal-jamming devices that prevent them from using cellular phones, lifting sanctions placed on some prisoners following the stabbing of two prison guards last month by Hamas prisoners, and the resumption of family visits. The inmates are demanding the removal of signal-jamming devices that prevent them from using cellular phones, ending sanctions imposed on some of the prisoners after the stabbing of two prison guards and resuming family visits to the prisons. Following the stabbing of two guards at Ketziot Prison in the Negev, the IPS imposed restrictions on dozens of prisoners for their reported involvement in the incident and a subsequent riot that erupted in the prison. On Friday, unconfirmed reports said that the IPS and the prisoners were close to reaching agreement to avert the hunger strike. The announcement would come ahead of the first anniversary of President Donald Trump’s decision to pull out of a 2015 nuclear deal with Tehran and reimpose sanctions that had crippled Iran’s economy. US Ambassador to Israel David Friedman will head a delegation of US ambassadors and White House representatives on the March of the Living, which will be dedicated this year to the struggle of the future generation against antisemitism and the memory of Greek Jewry. "We are marching to remind the world of the horrors of the Holocaust," said Dr. Shmuel Rosenman, founder and co-chairman of the International March of the Living. The 31st annual March of the Living will take place on May 2, 2019. Some 10,000 Jewish and non-Jewish youth from all over the world will walk 3.2 kilometers between Auschwitz and Birkenau in memory of those who perished in the Holocaust and in a call to fight antisemitism. This year, the main event of the Holocaust Day will be devoted to Greek Jewry and the singer Yehuda Poliker, who will participate in the parade and perform at the ceremonies. The participants in the march will call for a war against rising antisemitism and against the background of the growing trend of hate crimes against Jews around the world in the past two years. Concurrently, participants will cooperate in a large-scale digital ad campaign under the following criteria: #SayNoToAntisemitism. Anti-vaccination activists are using the yellow Star of David that Nazis forced Jews to wear during World War II to promote their cause. The Chelsea Football Club held a major fundraising event on Thursday to continue battling antisemitism in Britain, and with plans to expand its campaign to the US later this year. Under the leadership of club owner Roman Abramovich, Chelsea FC dedicated the star-studded dinner to help finish funding a new expansive Holocaust exhibition at the Imperial War Museums in London. The museum, which has a current Holocaust exhibit and opened in 2000, has its eyes set on revamping the exhibit’s narrative and to bring attention more profoundly to the community. The new section of the museum, scheduled to open in 2021, will take some of the existing material and integrate it with the World War II focus of the Imperial War Museums. In this way, the Holocaust’s account will be seen as part of the historic and social context that also influenced the war. The football club, which recognizes the oddity of pairing a sports team with a slightly marred past of racist behavior and incidents among fans, sees that the great influence it has over its fans makes it all the more imperative for it to educate and change attitudes. An Ethiopian-Israeli rapper making waves in Tel Aviv’s growing hip-hop music scene was the subject of a Vogue magazine profile published on Tuesday. According to the popular fashion magazine, which praised Eden Dersso’s “captivating and provocative work,” the rapper stands out as one of the country’s few female artists in the genre. “Ethiopian culture is fundamental” to Dersso’s work, the magazine added. The Rehovot native, whose family immigrated to Israel in 1992, said her heritage impacts her sense of identity, and explained that she feels Ethiopian when she’s in her hometown but very Israeli when traveling elsewhere. Throughout the trip he mailed postcards to his eight year old daughter Paulina, who was in Vienna at the time. The National Library of Israel has recently digitized a collection of these postcards; they can now be viewed online here. The messages on the postcards contain short but heartfelt expressions of love for his daughter. On one dated October 15, 1898, Herzl wrote "Tender kisses to my delicate daughter Paulina from her faithful Papa." That particular postcard was sent from Constantinople, which would soon be renamed Istanbul. "Herzl is remarkable in that his greatness has almost universally been recognized across the Zionist spectrum," commented Dr. Hezi Amiur, curator of the National Library's Israel Collection. "There are few if any other figures in Zionist or Israeli history for which this can be said." Beresheet, the Space IL spacecraft, is scheduled to land on the moon on April 11, one week after successfully completing its most critical maneuver on Thursday afternoon. During the complex moon-capture maneuver successfully carried out by SpaceIL's engineering team and IAI on Thursday night, Beresheet photographed spectacular images of the moon while the engines were running and at the peak of the moon's capture maneuver. The images provide a rare visibility of the lunar surface in perspective that can not be photographed from Earth. One picture shows the earth is hidden by the moon. The larger craters seen on surface are the oldest craters of more than 4.5 billion years old, the smaller craters are younger.